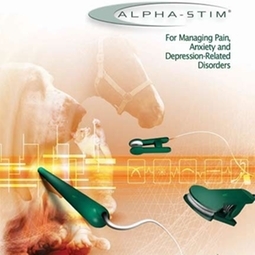 Alpha-Stim 100 is a prescription medial device which uses combined micro current electrical therapy (MET) and cranial electrotherapy stimulation (CES). This nontraditional therapy has many uses including treatment of pain related to injury, arthritis, senility, obsessive compulsive disorder, separation anxiety syndrome, urinary incontinence and anorexia in cats. The relief from Alpha-Stim is residual and cumulative, resulting in less frequent use. We are very excited to offer this alternative therapy to our clients.